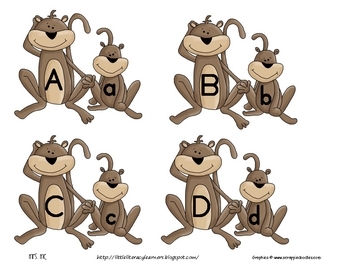 Mommy and baby monkeys to help practice identifying upper and lower case letters and their corresponding sounds. 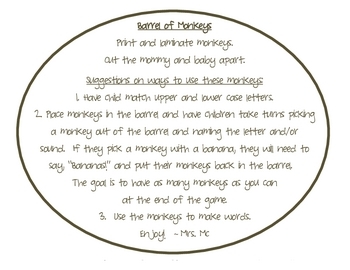 Suggestions on how to use the monkeys are included! I do need to apologize to you, because when I save the document as a PDF file the lower case "u" does not look right. So please accept my apologies ahead of time if it does not print correctly, I am hoping you can just use a black marker to fix it. The other letters should be okay.